Lyn 1.5.2 – Lightweight image browser and viewer. Lyn is a lightweight and fast image browser and viewer designed for photographers, graphic artists and Web designers. Featuring an extremely versatile and aesthetically pleasing interface, it delivers an easy-to-use geotagging technology and a complete solution for sharing your photographs. 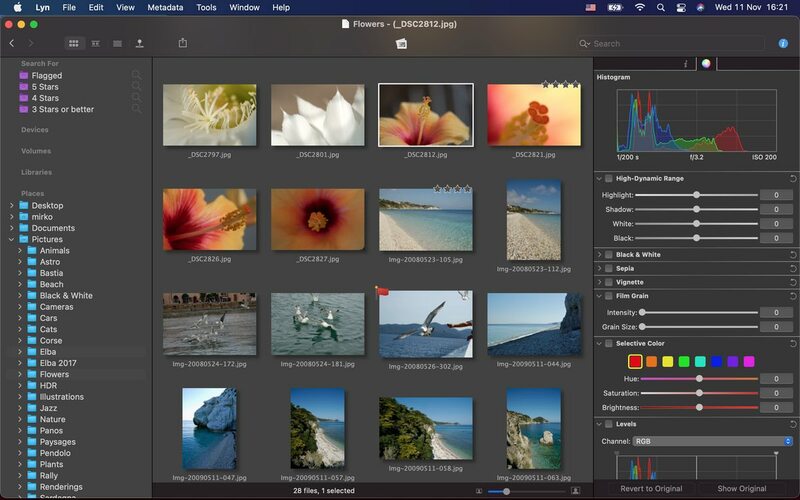 Lyn natively supports all popular image formats like JPEG, TIFF, JPEG 2000, PNG, PPM, TGA, RAW, HDR, OpenEXR, animated GIF, and any other image format supported by OS X. It also integrates a movie player to watch camera recordings. The new editing inspector gives you everything to turn your shots into great photos. Adjust exposure, color temperature, brightness, and contrast or reveal image details with highlight and shadow adjustments. You can experiment and convert your color photos to black and white, try a classic sepia tone, or add a vignette. Progressive display, on single- or multiple-monitor configurations, of images of virtually any size. Multi-threading to take advantage of multicore CPUs. Display color-corrected images and soft-proofing function. Compatible with High Dynamic-Range images like TIFF float as well as Radiance and OpenEXR. Common metadata parser: EXIF, Camera’s makernote, GPS, GeoTIFF, IPCT. Image navigation with Apple Remote Control or Magic Trackpad. Filtering by tags and metadata. Fullscreen and slideshow with music. Full IPTC editing with user-defined presets. Batch operations: convert and rename. Editing inspector with filters and effects: temperature and tint, exposure, brightness, contrast, highlight, and shadow. Black and white, sepia tone, and vignette. Easily browse your iPhoto, Aperture, and Lightroom libraries! Facebook, Flickr, Dropbox, SmugMug, 500px, and Picasa Web Albums sharing! Maps layout: geotag your photographs and edit locations with a simple drag and drop. Next story Music Player 2.2 – a must have music player to enjoy listening to millions of popular songs. Previous story Hourly News 1.3.5 – Play the most recent news updates from multiple sources with just one tap. LensFlare Studio 5.1 – Bring your photos to life. DXO PhotoLab 1.2.3 – Image enhancement for RAW and JPEG files. TurboLayout 2.0.16 – Design a Beautiful Image Graphic with Incredible Ease.